I recently found a new line that really inspires me: Stick & Ball. Growing up in Argentina, I have always had a deep love for horses and the countryside. When I heard that Elizabeth Welborn was starting her own “Polo Ranch inspired line” I knew it was something special. Elizabeth’s style has always been a mix of country chic and bohemian. Sheis always at home in jeans, boots, T-shirts, tunics, knitted hats, cowboy hats and ponchos. She has traveled extensively in Central and South America since she was 19 for Spanish studies and for work. This travel experience, as well as her many beloved friends from the Southern hemisphere and a love for Latin music, has morphed her style to include inspirations and influences from the Latin countryside. Elizabeth’s husband also loves horses and nature, and started playing polo over 10 years ago. After 2 children, Elizabeth decided to give Polo a try as well, and began to “stick & ball” which means informally play and practice hitting the ball. Not only did she discover the most amazing sport in the world and became completely addicted, but also felt this style of country chic-Latin-bohemian would be a gorgeous combination for an apparel and home line. That is when everything started. 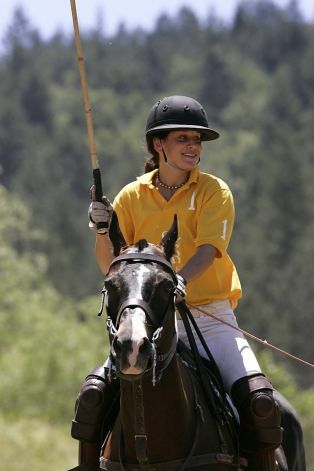 Polo is played throughout the West coast and Latin America in the countryside, generally not in big city settings. Her inspirations come from the country as well as the many and varied horse cultures throughout the Americas- from the Argentine Gaucho, the South American “Campesino”, the North American Cowboy and the indigenous communities throughout the Americas. It is definitely a “brand of the Americas”. Geometric indigenous prints are some of the patterns in textiles seen throughout the Americas and are a big influence in “Stick & Ball” pieces. Her line is all about natural fibers and textiles found in the Americas- cotton, alpaca, wool, leather, hemp, flax, cow horn, wood, silver, etc. The signature poncho features a hand knitted, alpaca collar on an alpaca/wool poncho that adds a bit of chic and luxury to the typical, countryside poncho. The throw or shawl from the first line is also made of alpaca with cotton and has geometric patterns typically found in woven textiles of Peru. The first line of ponchos and throws are made in Peru. Peru is famous for their alpaca and cotton fibers. Their quality of hand knitted and hand woven textiles is excellent. Elizabeth feels proud of who makes her products as she knows the craftspeople personally, and they are recognized by the US AID for fair wages and labor practices. Stick & Ball has a typical client: someone who enjoys a flare of country in the city or a bit of chic in the country. The ponchos can literally be worn with anything. You can wear them with jeans, yoga pants and can easily pull off a great outfit with black or brown leather pants. I think they are the perfect addition to any wardrobe. They are definitely stylish, versatile and Latin Chic. Elizabeth is in the process of expanding the line to include a gorgeous and comfortable white denim, (a staple for any polo player or polo spectator), an amazingly soft pima cotton, jersey knit polo shirt, leather boots, leather and woven belts, purses, and a few new poncho designs. She suffers from the same problem as most busy moms, however, in that juggling work and motherhood, (and horses), puts a delay in most things. But she is also a true LatinGringa, fighting for her passion and living for her family.